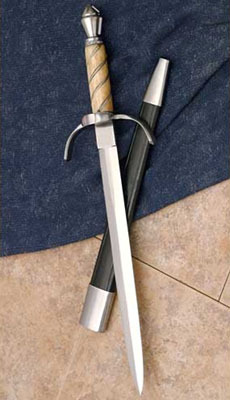 The left hand dagger, or “Ring Hilt” dagger, was employed in the art of rapier and dagger swordplay. It was often worn at the back tilting to the left for easy access. This offering matches nicely with our three ringed Deschaux rapier. The parts are steel and the grip is bone wrapped in wire for a good grasp. Includes scabbard.